Ashley Warren knows she's in trouble as soon as she sees Kosar. The tall, powerful dragon shifter has a body to kill for, a smile that makes her heart race, and eyes that look straight into her soul. If only she could listen to what her body wants, she’d forget about her mission and throw herself at him. The trouble is, she’s on Mars to steal from him. Worse, the people who sent her aren’t the forgiving type — and they have her brother as a hostage. If she doesn’t bring them the information they want, he’ll pay the price. Kosar is a dragon warrior, a defender of the most precious artifact the Dragon Empire possesses. The stardrive that brought the dragon shifters to Mars is his to guard while its secrets are studied, and he will not allow thieves to take it. His duty is simple until he meets Ashley. The moment he looks into the human female’s eyes, he knows they belong together. She’s his mate, chosen by fate to be by his side, and he would give anything to protect her. But as evidence mounts that she’s planning to steal the secrets he’s guarding, he’s torn between his duty to the Empire and his feelings for his mate. Caught between their conflicting obligations, can Kosar and Ashley find a way to be together? Or will duty pull them apart? 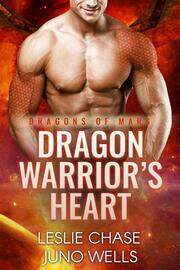 DRAGON WARRIOR'S HEART is BOOK 5 of the DRAGONS OF MARS. You don't have to read them in order, but it will be a richer experience if you do!